﻿ Chelsea 1-3 Real Madrid. 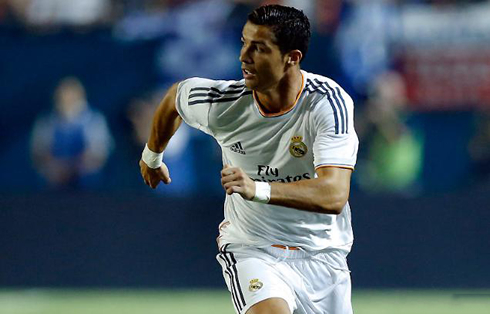 Ronaldo answers Mourinho by scoring twice! 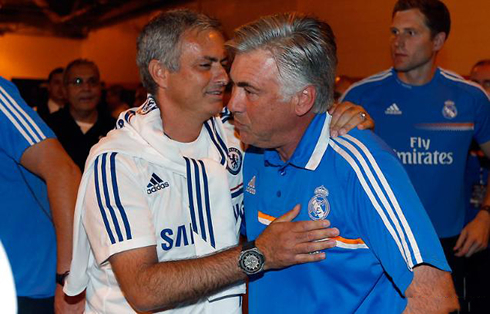 07.08.2013 » Chelsea 1-3 Real Madrid. 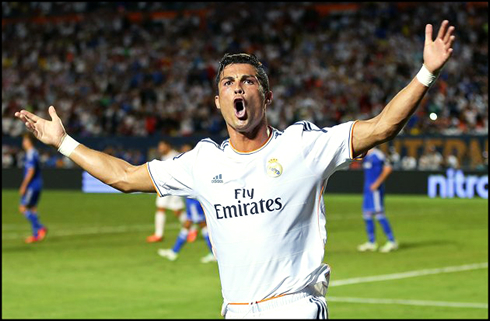 Ronaldo answers Mourinho by scoring twice! Real Madrid and Chelsea FC faced each other in the Guinness International Champions Cup final this Wednesday night, for one of the most anticipated matches of this pre-season. 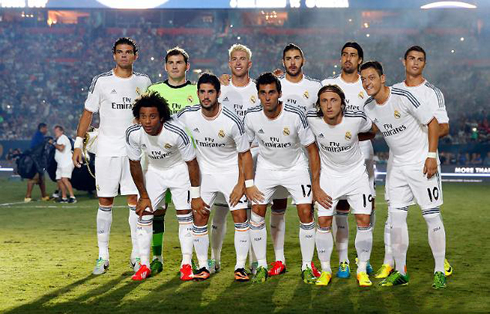 The Merengues managed to come on top at the end and took the trophy back to Madrid in great style. Cristiano Ronaldo scored two terrific goals and left José Mourinho with no other option but to swallow his own words and remarks, that he made about Cristiano Ronaldo just a few days ago. The Merengues have beaten Chelsea FC last night in the United States, after pulling off a very tasty 1-3 win against their former boss José Mourinho. The Portuguese manager ended up leaving Madrid last season, after seeing several key players in the team becoming more distant from him throughout his time at the Spanish club. One of them was Cristiano Ronaldo, precisely the man who Mourinho decided to pick on earlier this week, when he commented that he had already trained one Ronaldo in the past, not the one currently playing for Real Madrid, but the real one from Brazil. He should have known by now that provocking Cristiano Ronaldo is usually a very bad idea, especially when you find yourself at the opposite side. 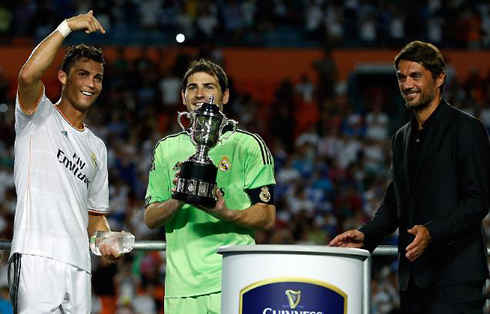 The Portuguese star gave his old manager a "real" lesson, scoring two superb goals and delivering this Guinness pre-season trophy to Real Madrid. As if a cup final between Chelsea and Real Madrid, where a pre-season title was on the line, wasn't enough itself to draw interest across all football enthusiats around the world, the game got spiced up by José Mourinho's statements a few days ago, where he claimed that Real Madrid's Cristiano Ronaldo was not the "real Ronaldo", since that one was the Brazilian that he coached in Barcelona back in the 90's. However, his words backfired him, as CR7 delivered a superb performance by scoring a brace and dismantling Chelsea's whole defense, piece by piece. Carlo Ancelotti didn't risk making any changes in the line-up he had already used against Everton FC in the past weekend and saw his strategy paying off at the end. The Merengues midfield showed a great passing dynamic when dictating the tempo and pace of the attacks, while at the same time, Cristiano Ronaldo showed his best version of this new 2013-2014 season. The Portuguese star showed once more that he has a lot more to offer to his team when he's given the freedom to explore the wing and to cut inside whenever he gets a chance for that. Chelsea's defense and Mourinho's strategy quite simply failed to control the Portuguese forward's irreverence. With 14 minutes on the clock, the Merengues grabbed the lead thanks to a good goal from their left-back, Marcelo. The Brazilian defender picked up a low pass from Luka Modric very near Chelsea's penalty area, kept driving the ball a few more meters ahead and benefited from Gary Cahill's passivity to release a crossed shot into the low corner of Petr Cech's goal. The Czech goalkeeper still got to touch the ball with a finger or two, but it wasn't enough to send it away. Real Madrid was suddenly one up, but the game was clearly still going to offer a few more goals to its spectators. Ancelotti's side got in the front for the second time on the night after seeing Cristiano Ronaldo pulling off one of those mesmerizing free-kicks that only very few players in the World are capable of. The 28-year old is getting used to beat Petr Cech everytime he faces the Czech goalkeeper and this time it wasn't any different. The free-kick shot still touched the crossbar but it wouldn't stop until it hit the back of the net. It has been the second free-kick goal in Ronaldo's tally this pre-season, which leaves the Madridismo with good reasons to believe that these kind of set pieces plays can turn out to be a key factor in the upcoming challenges that lie ahead. Both teams headed back to the dressing rooms shortly after, but the Merengues were clearly the ones with more reasons to be happy with their performance so far. Cristiano Ronaldo wasn't done yet though and not only he played the remaining 45 minutes, as he also seized another opportunity to score his second on the night. The former Malaga midfielder Isco came up with a perfect cross into the heart of Chelsea's penalty area and Cristiano Ronaldo appeared from behind like a bullet, to head it past Cech and put the Merengues two goals up on the scoreboard. There would still be time for Cristiano Ronaldo to show a very positive reaction when a fan invaded the pitch to hug him. The former Manchester United player returned the hug for several seconds and made sure that the fan didn't get knock down by any security guard nearby. The match ended with a Real Madrid 3-1 win over Chelsea FC and with Cristiano Ronaldo proving to even the most skeptic fans that he's more than ready for the new season's kickoff. Cristiano Ronaldo next game for Real Madrid will be against Inter Milan, this next Saturday (August 10, 2013). In the meantime, you can watch Real Madrid vs Inter Milan, Malaysia vs Barcelona, Manchester United vs Sevilla and Liverpool vs Celtic, all matches provided from our live football streaming section.